A collaboration with the McLaren Formula 1 team produces a million dollar watch that's the lightest chronograph ever. 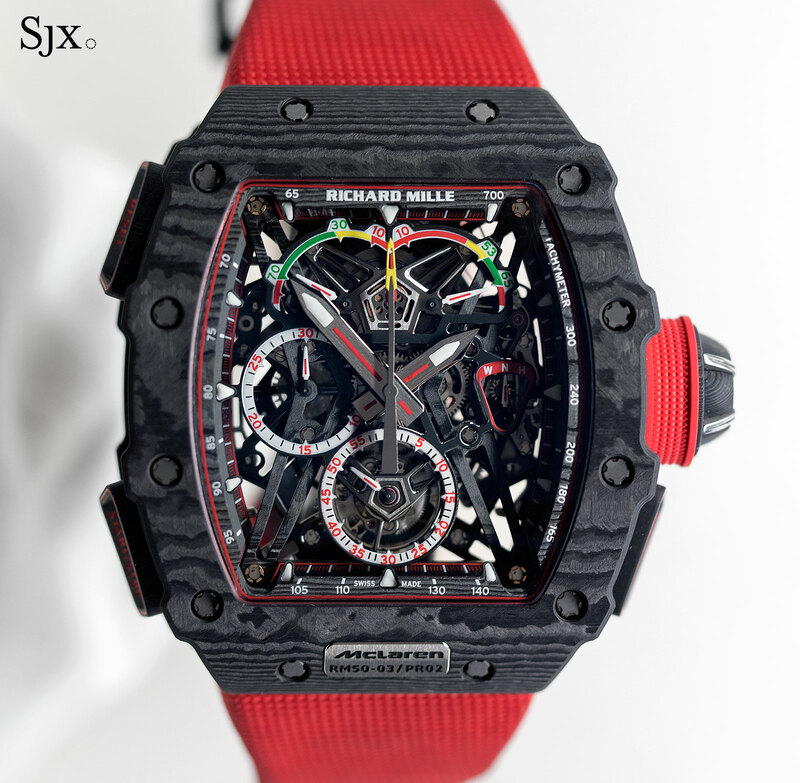 Richard Mille took a distinct turn towards a more aggressive aesthetic with its SIHH 2017 line-up, particularly with the key launches, the RM 50-03 McLaren F1 and the RM 11-03, characterised by more sharply defined forms and complex details. 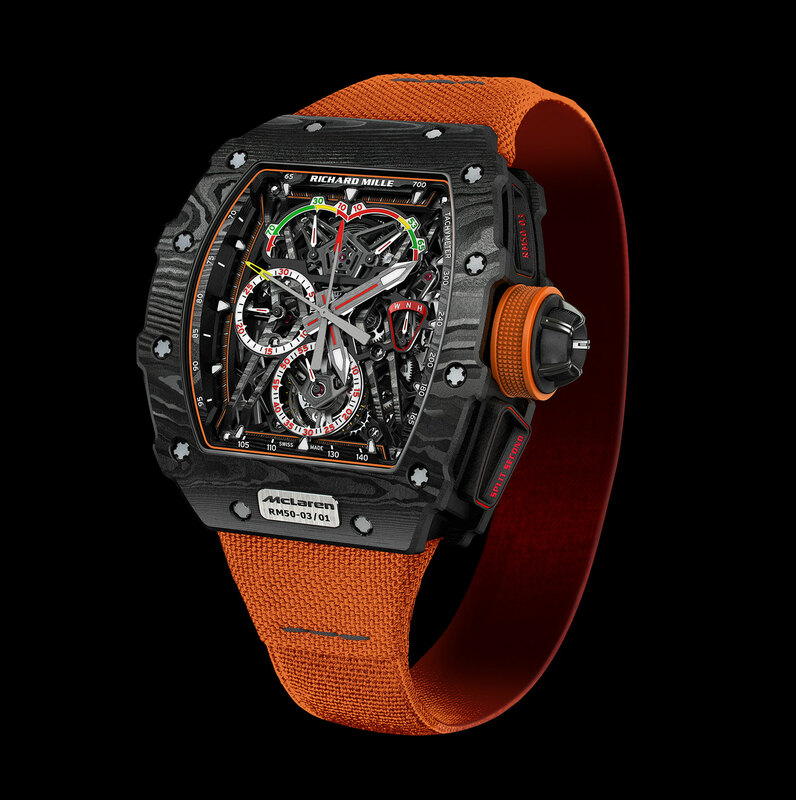 The result of a tie-up between the McLaren Honda Formula 1 team and Richard Mille, the RM 50-03 McLaren F1 is an ultra-light split-seconds chronograph with tourbillon that’s the lightest mechanical chronograph ever – the entire watch with the strap weights less than 40g or 1.4oz, or less than nine sheets of A4 printer paper. 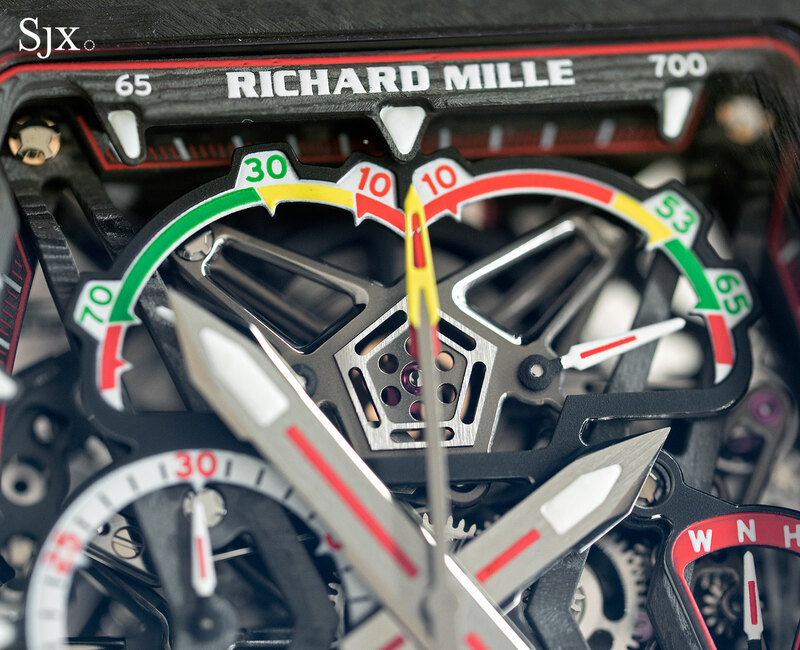 As it is with all of Richard Mille’s ultra-light watches, the disparity between the perceived and tangible weight of the watch is one of its key qualities. 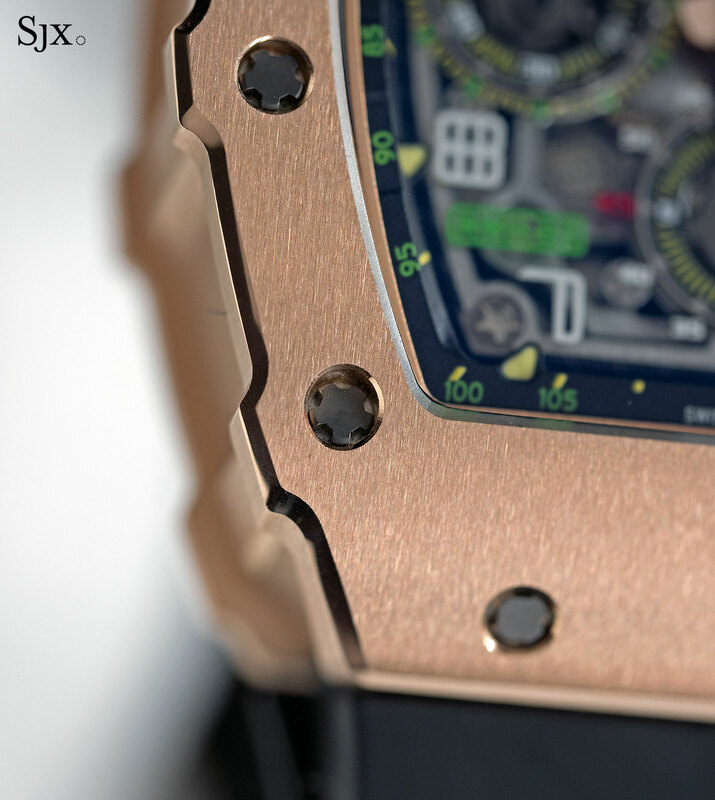 The RM 50-03 is very large, one of the biggest watches in the collection, measuring 44.50mm in diameter, 49.65mm long and 16.10mm thick, yet in the hand it feels shockingly light. 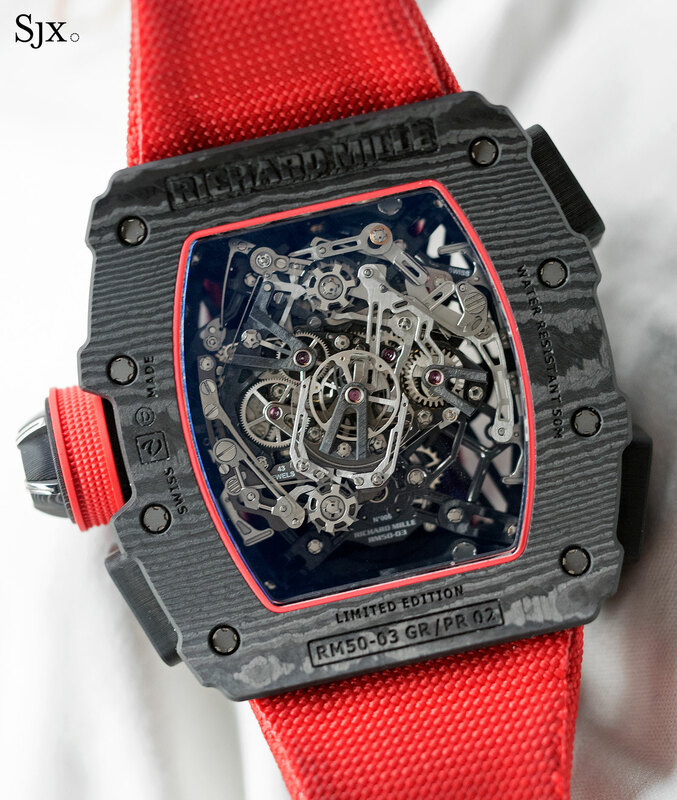 That’s down to the materials used for the case and movement, which includes graphene for the first time in watchmaking. 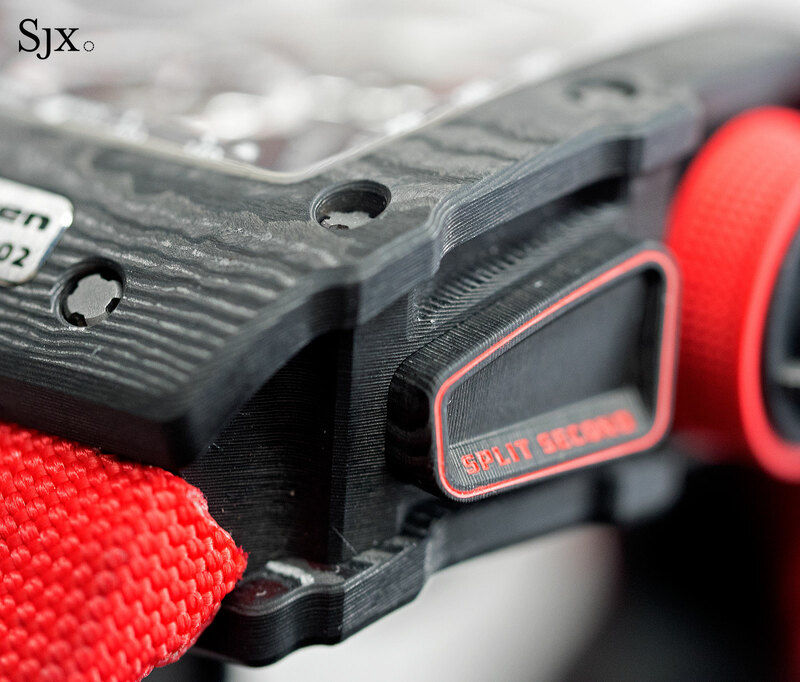 Even the stretchy synthetic fabric strap is injected with graphene. Light, strong and highly conductive, graphene is an special form of carbon that was discovered at the The University of Manchester in 2004, winning the scientists behind it the 2010 Nobel Prize in Physics. 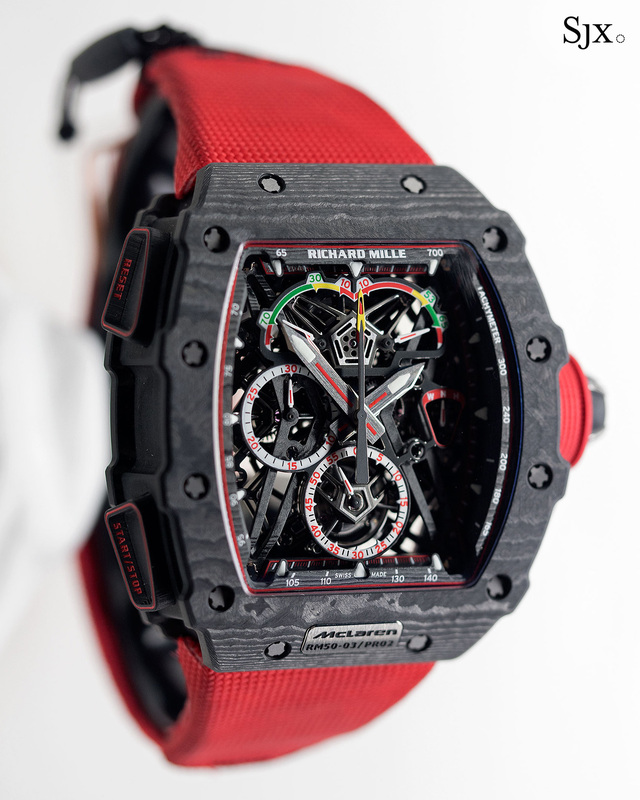 The case of the RM 50-03 is made of Graph TPT, a carbon fibre-reinforced polymer containing graphene, which was developed by The University of Manchester, McLaren Applied Technologies and Swiss material specialist North Thin Ply Technology (NTPT), the same company responsible for all of Richard Mille’s composite cases. The striped appearance of Graph TPT is the result of the production process, in which layers of carbon are mixed with a graphene-laced resin then baked in an autoclave. 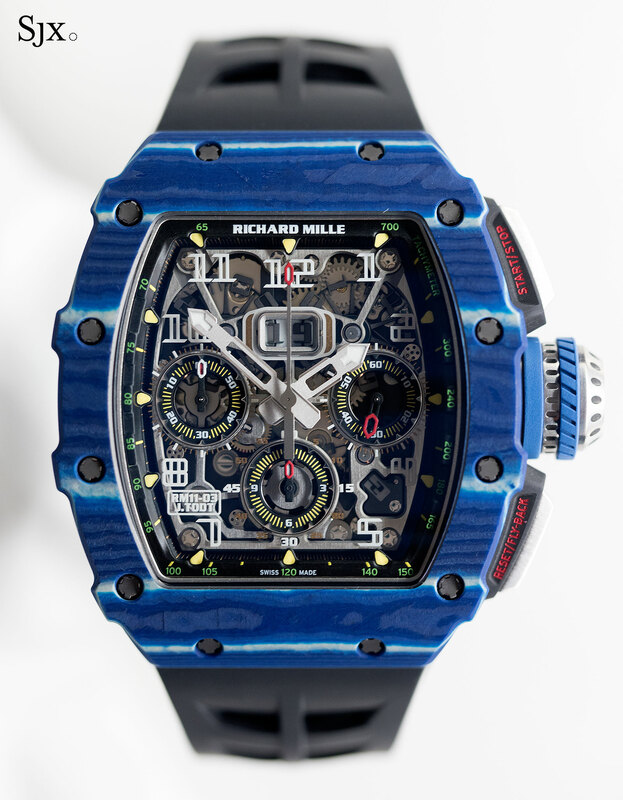 It’s similar to materials already used by Richard Mille, hence the familiar banded appearance, but the addition of graphene is novel. 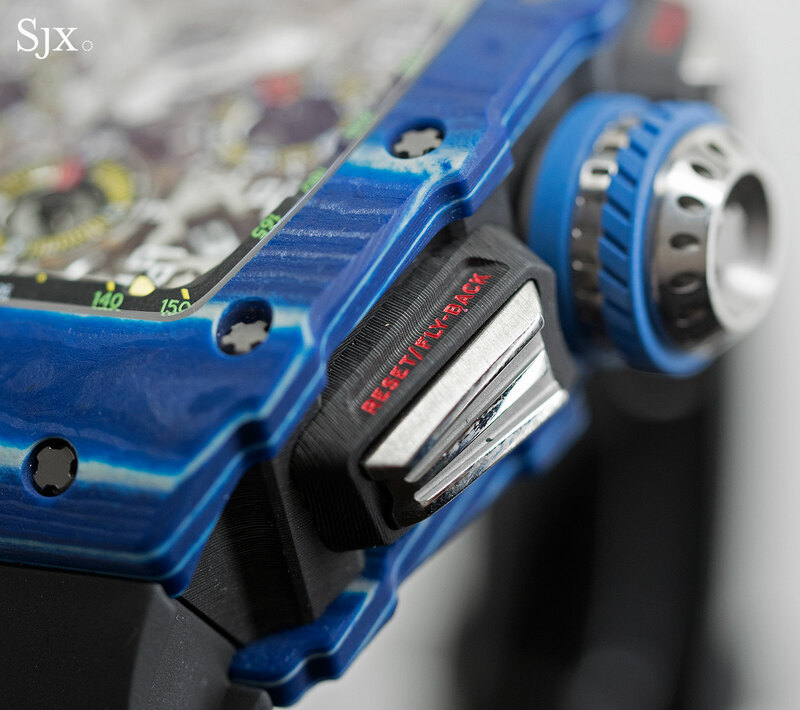 Not only is the case ultra-light, but so is the movement, which weighs just 7g. Skeletonised to remove all necessary material, the bridges and base plate are made of titanium and Carbon TPT – another form of carbon composite. 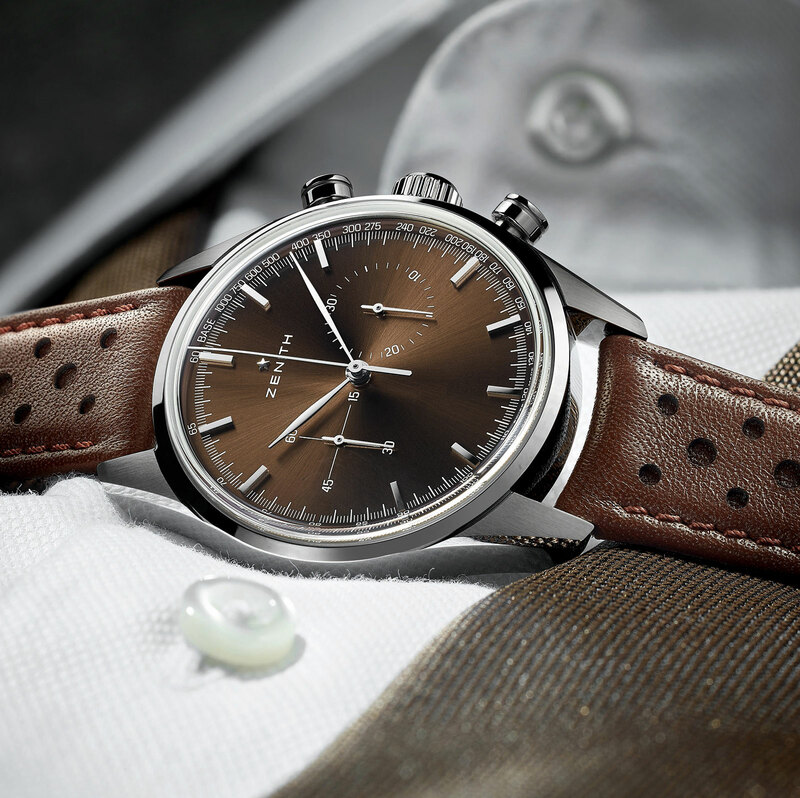 Hand-wound with a 70-hour power reserve, the movement also has a power reserve display at 11 o’clock and a torque indicator at one o’clock. Despite the striking novelty of its aesthetics, mechanically the movement is constructed like a traditional, high-end split-seconds chronograph and tourbillon; in fact it’s similar to the calibre inside last year’s flagship RM 50-02 ACJ. 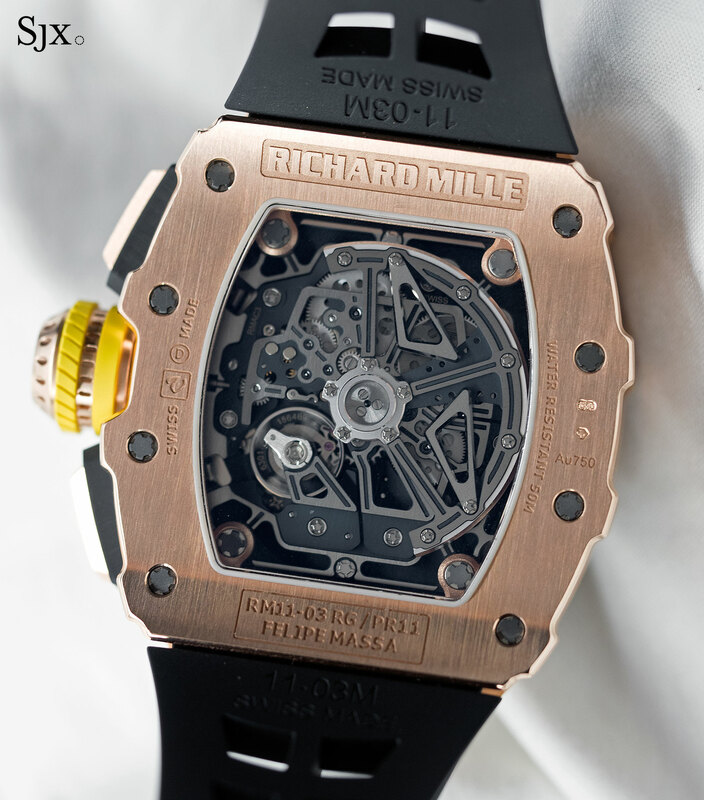 Like all other complicated Richard Mille movements, the calibre was made by Renaud & Papi, the respected Audemars Piguet subsidiary specialising in complications. 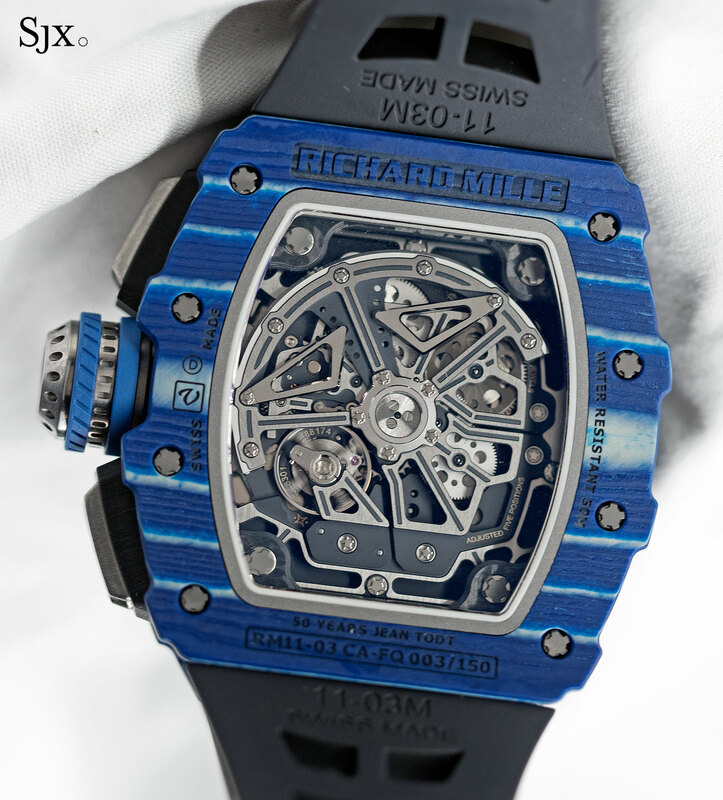 Visually the watch has all the design cues of the latest generation Richard Mille watches, including the notched outline of the tonneau-shaped case, but also more angular details, like the lance-shaped hands and markings on the sub-dials and indicators on the top half of the dial, giving it a more aggressive look. And it should be noted that while the watch pictured here is red, the production version will be closer to orange, as depicted in this stock image. Available only at Richard Mille boutiques, the RM 50-03 McLaren F1 is a limited edition of 75 pieces, priced at SFr980,000 or S$1.55m. 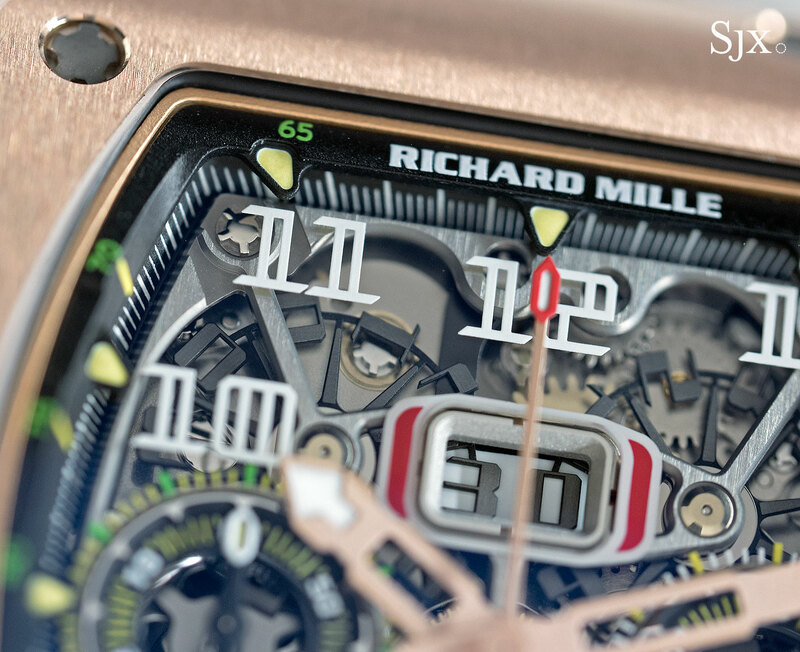 Announced late last year, the RM 11-03 is the second generation of Richard Mille’s bestseller, a flyback chronograph with an annual calendar. 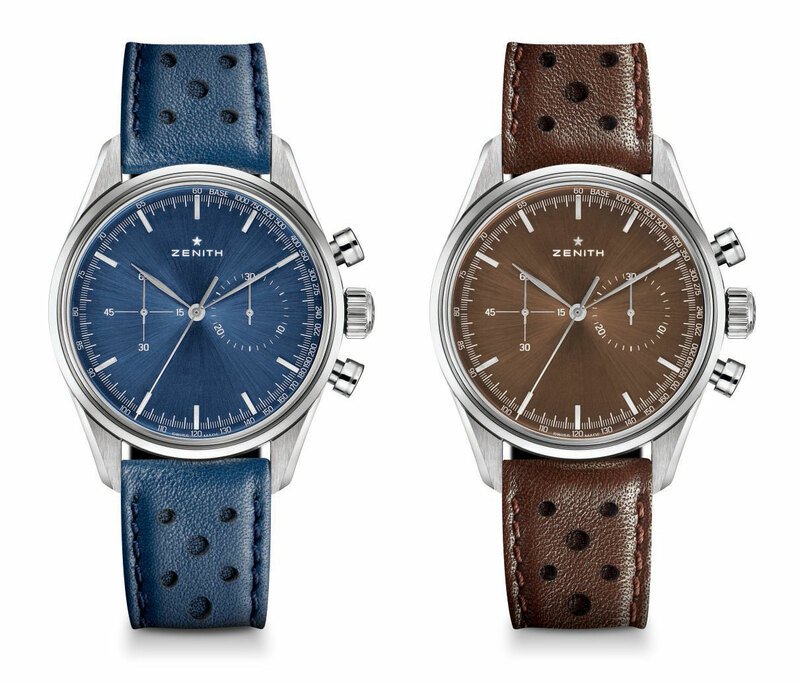 While mechanically unchanged, the watch has undergone a significant redesign, with a wider case and restyled movement bridges. The new look is more aggressive and mechanical. 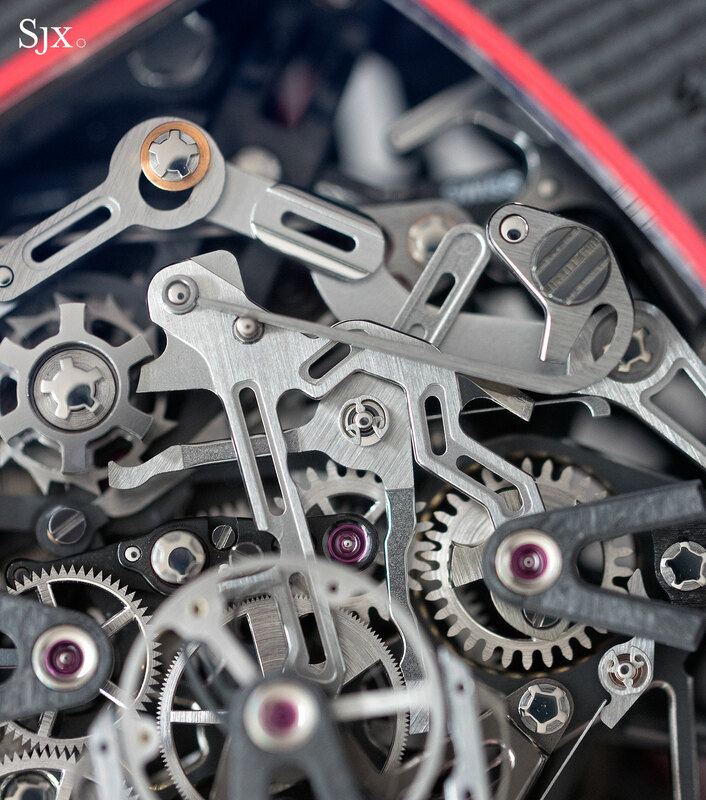 The insides remain the same: an automatic Vaucher movement with a Dubois-Depraz module on top that has both chronograph and annual calendar complications. 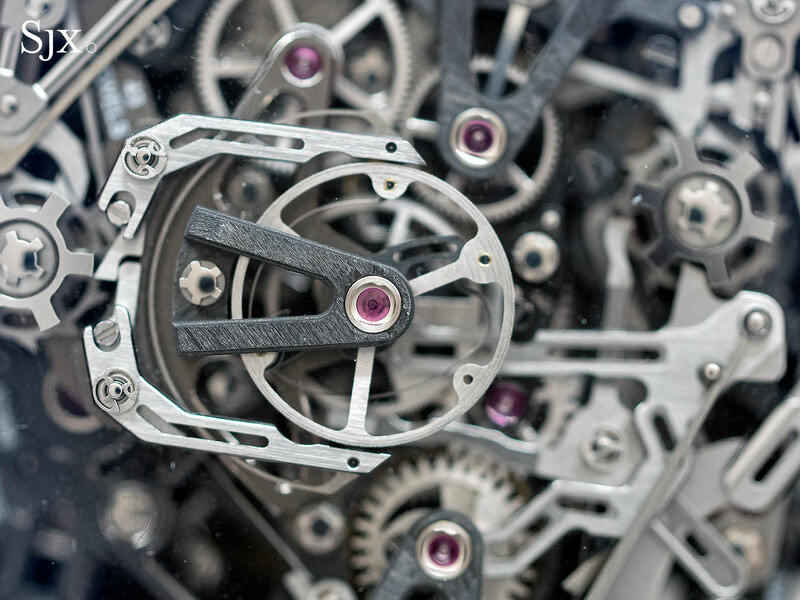 Notwithstanding the complex appearance, the movement is basic, as well as tried and tested. The only notable change to the movement, besides the cosmetic reshaping of bridges, is the variable geometry rotor. 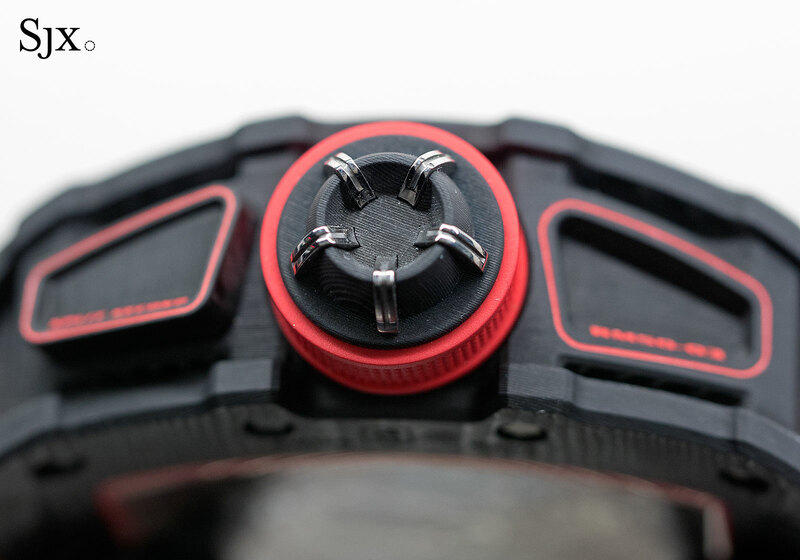 The triangular plates on the rotor can be adjusted by a watchmaker to suit the wearer’s level of activity, so as to optimise winding efficiency. The RM 11-03 costs approximately SFr150,000, depending on case material. A variant of the RM 11-03 that made its debut at SIHH 2017 was the RM 11-03 Jean Todt 50th Anniversary, one of a trio of watches made for the Formula 1 executive and former Ferrari chief executive to mark the 50th anniversary of his motorsport career. 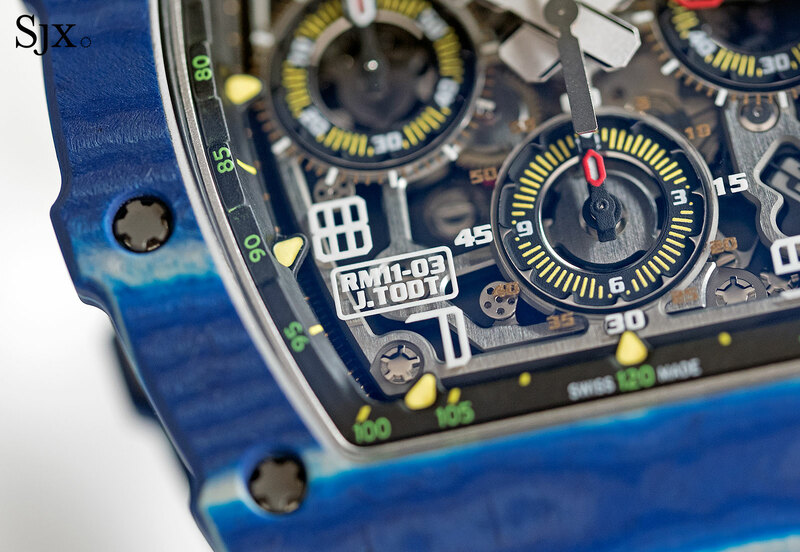 The case is made of blue and white Quartz TPT, which is a carbon composite mixed with quartz. 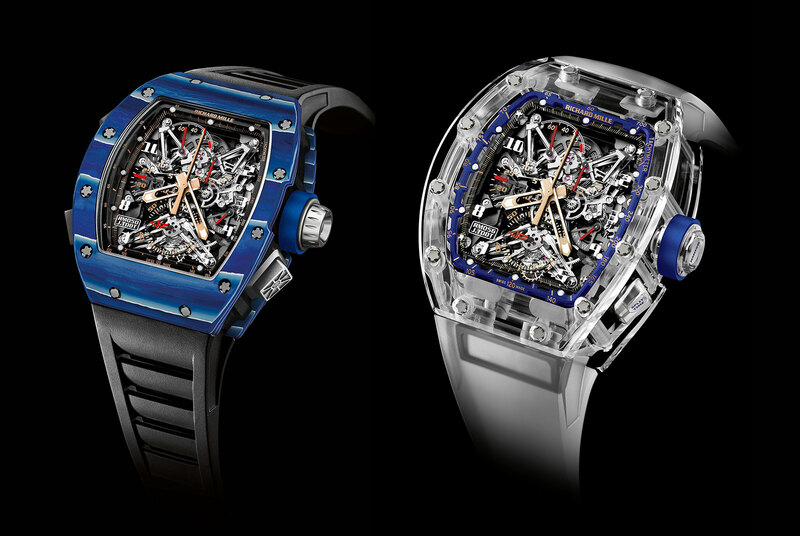 Limited to 150 pieces, the RM 11-03 Jean Todt 50th Anniversary costs SFr150,000 or S$217,800. 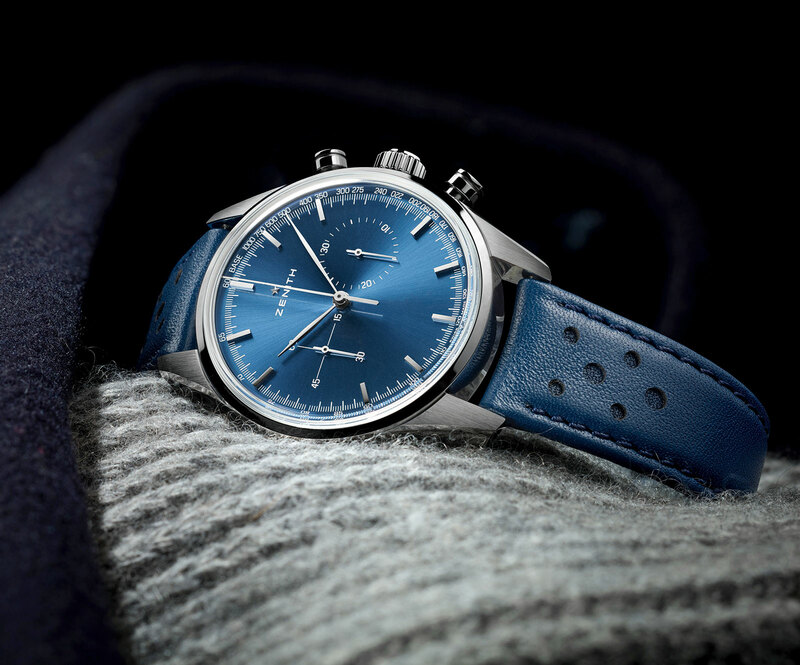 The same blue and white Quartz TPT is also used for the RM 050 Jean Todt 50th Anniversary, a split-seconds chronograph with tourbillon that’s powered by a movement similar to the one in the RM 50-03 McLaren F1 above. 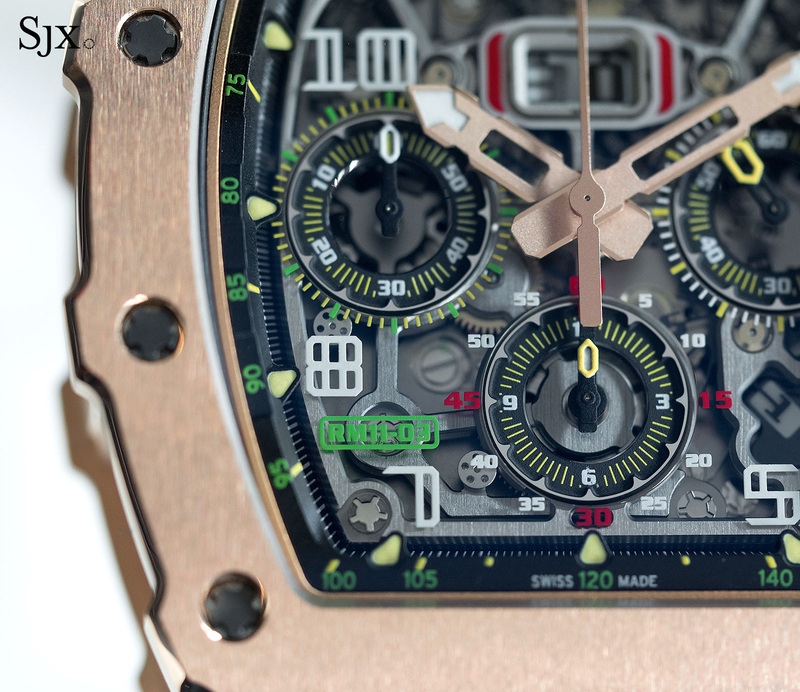 This is limited to five pieces, with a price of approximately SFr900,000. And the RM 056 Jean Todt 50th Anniversary is the pinnacle of the range, a split-seconds chronograph and tourbillon inside a sapphire crystal case that has a blue chapter ring and crown. Only three will be made, with a price of approximately SFr1.7m. And the 2017 line-up also included several ladies’ watches, including the RM037 Gem-Set NTPT Carbon. First revealed in November 2016, the front and back plates of the watch case are made of NTPT Carbon, a carbon composite material. Narrow channels are machined out of the surface of the carbon composite to accommodate gold prongs to hold the gemstones, making this one of the first ever watches in carbon composite to be set with precious stones. 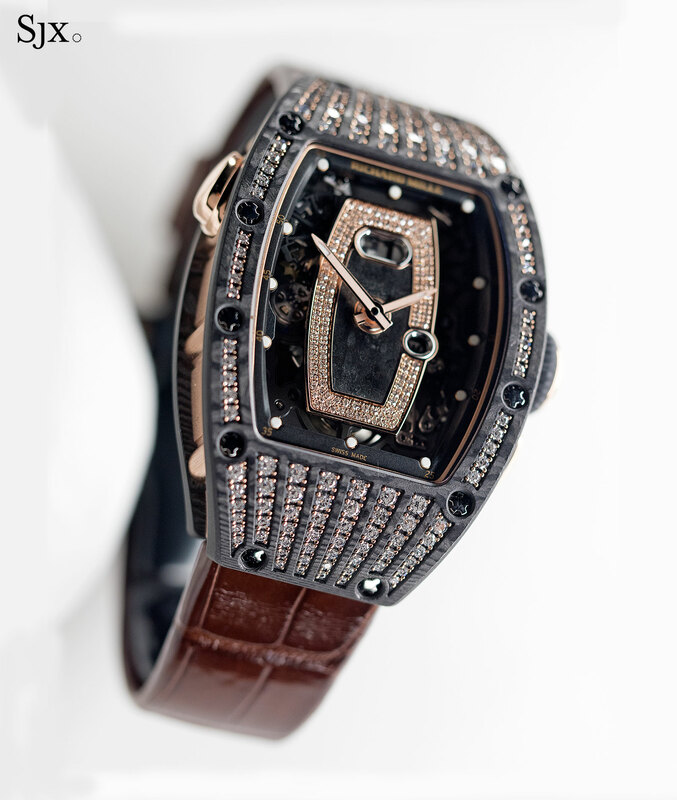 This particular specimen is set with diamonds, but other stone combinations are also available. 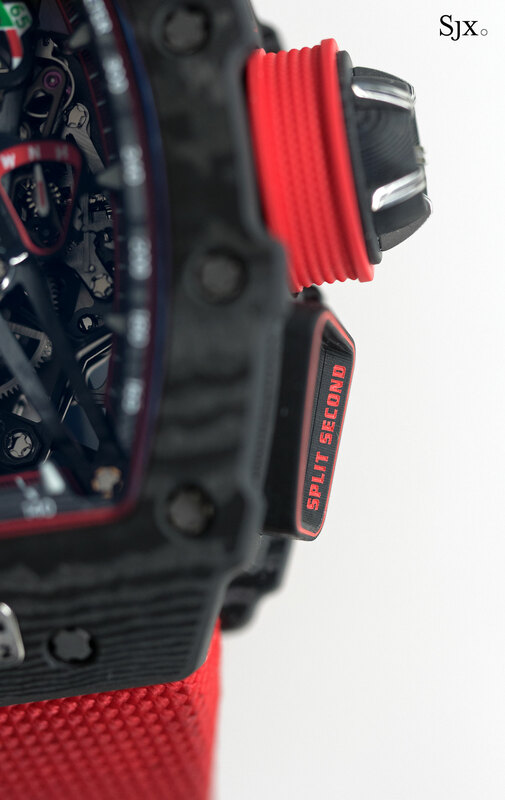 The same gem-set carbon composite case can also be had on the RM 07-1. 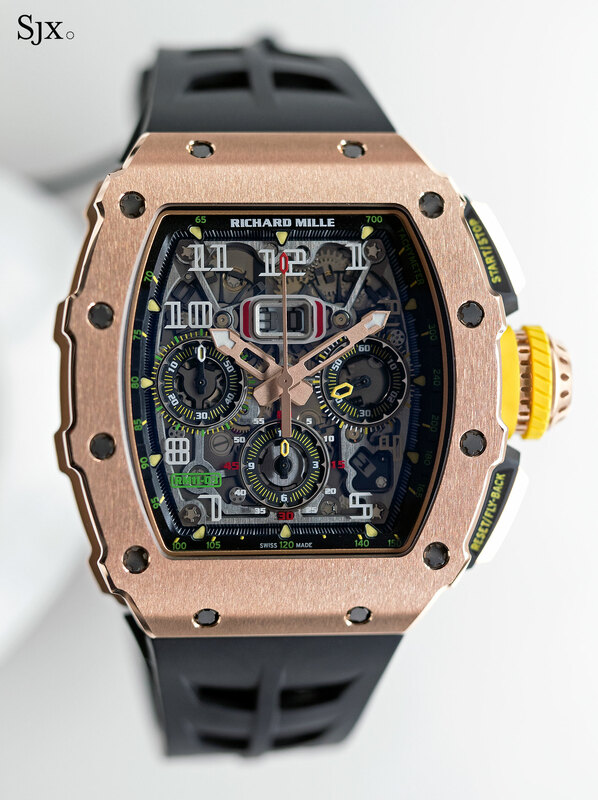 Richard Mille continues to forge ahead in carbon composites with its new gold leaf and carbon cases on a pair of new ladies' watches, the RM 07-01 Gold Quartz0TPT and the RM 037 Gold NTPT Carbon.